Home » dolls » >Some sewing- in real life and minature. >Some sewing- in real life and minature. >Ah… Halloween weekend. I love this weekend. Pumpkin flavored things (I’ll be baking a pumpkin pie right after this blog post), kids excited about trick or treating, decorations. I love it. I especially love pumpkins! There has actually been some sewing! 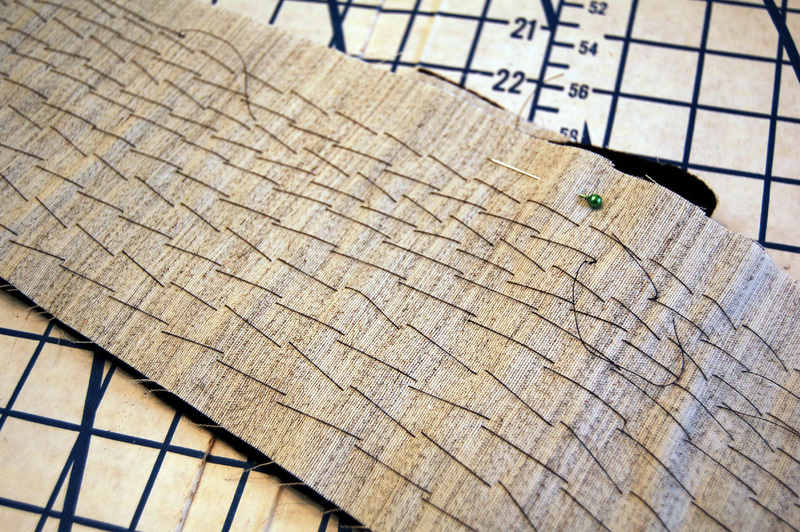 I picked up the coat again and have started my padstitching. If I want to get it on the way I need to stop procrastinating about it! It’s rather sloppy as I was doing it at night while drugged up on Nyquil (thus the variations on size… lol), but it’s getting there. Since I don’t have a set roll line I’m not too worried about it. 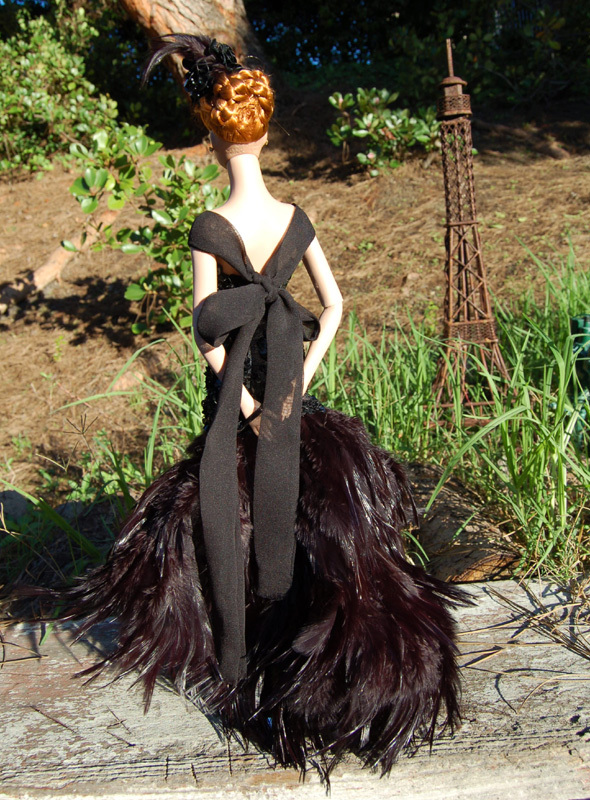 And my doll has a dress for Halloweenie. I figured that just cause I’m lame and not doing anything didn’t mean I couldn’t have *some* element of fancy dress. This time she’s wearing it instead of me… but I want one my size. The sequins were neat left over trims of sequins and beads on netting that were salvaged from something really old by the original owner. I found them at the estate of a circus performer who sewed her own clothes. It’s one of those places you wish you could go back and have a re-do- she had boxes of patterns she drafted herself and at the time I passed them up but I wish I could go back and rescue them now! One of her amazing dresses is now at the home of one of my best friends… a stunning champagne formal satin dress. Yummy! 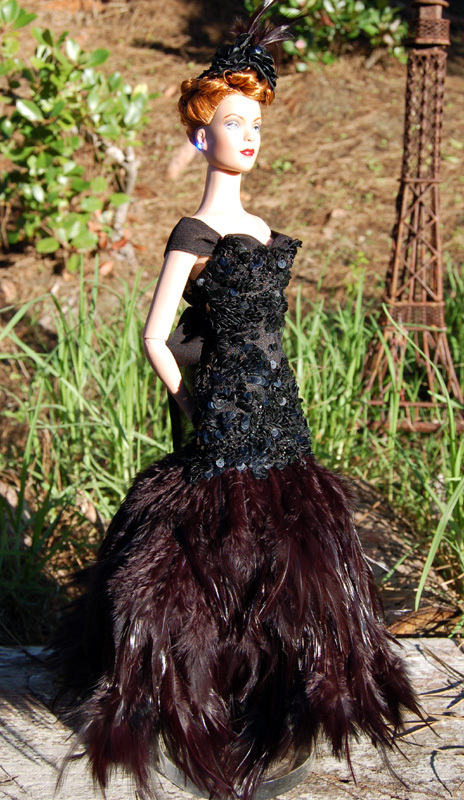 In any case- even though there wasn’t enough sequins to make something big for me, there was enough to use for the doll. And she got the leftover feather trim I had in the stash, too! My husband has officially christened this “The Rocket Chicken Dress.” Isn’t he a darling? Hehe. Guess that’s all the news here. Hope you’re all having a fun weekend! 6 Comments on >Some sewing- in real life and minature. >Your dress is beautiful! Did you make the pattern yourself? >Thank you, Diane! That means a lot to me coming from you! :DI based the basic shape off of McCalls 3834 for size and dart placement but them pretty much draped the bodice and drafted the skirt. 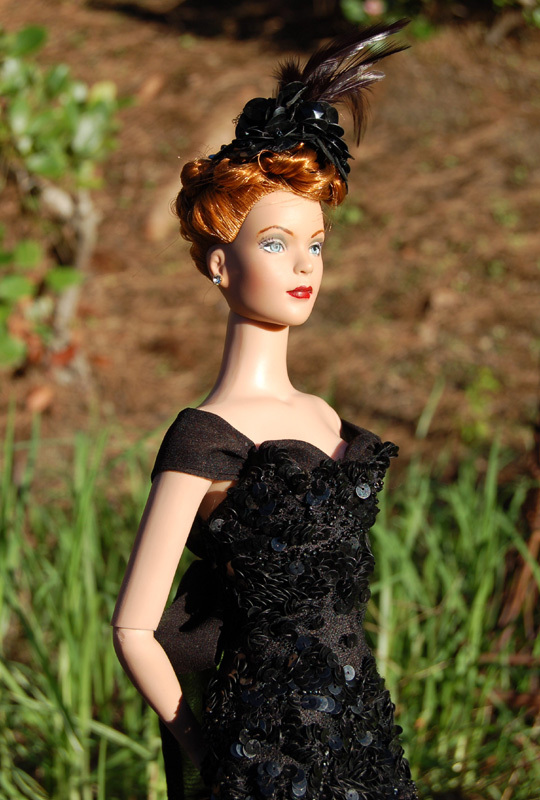 This is the first dress I'm made for a doll in my adult life and felt all thumbs! >The "Rocket Chicken" dress is magnificent! Just caught a peek of your pumpkin patch photos, too. Your hat is ADORABLE…and ADORE your cardi, too! I have been eating pumpkin muffins non-stop lately (dangerous business). Clearly, I share your love of pumpkiny goodness! Happy Hallowe'en!!! >Rocket Chicken Dress? Thank goodness you don't give him the job of writing your Etsy descriptions! What a fabulously fun dress! Nice work…Happy Halloween! >Lovely! I adore the dress. Sooo cute!